Diamond’s Steak and Seafood, an Adam Merkel Restaurant, opened yesterday in downtown Royal Oak in the former Cantina Diablos. The new restaurant is located at 100 S. Main St. (southwest corner of Main and 11 Mile Road). 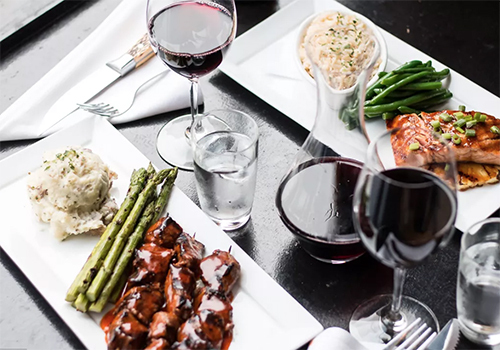 The menu includes fan favorites from the original location in Howell, including its signature steak salad, filet mignon tips, pan-seared sea scallops, the Diamond Burger, and homemade carrot cake. New dishes include the wild flounder meuniere, blackened ahi tuna, and wagyu beef carpaccio. The restaurant offers beer, wine, and cocktails. Merkel and Craig Myrand, chef and culinary director, created the menu items. Brunch also will be available on the weekends from 9 a.m.-2 p.m. and offer omelets, eggs benedict, carved ham, homemade waffles, artisan breads and bagels, beef stroganoff, sweet Cajun grilled chicken skewers, an array of deserts, and a Bloody Mary bar. The 7,000-square-foot restaurant was designed by Birmingham architect Ron Rea and seats 173 guests in the main dining area, bar, and patio. Two private dining areas sit up to 50 guests each. Hours are 4 p.m.-11 p.m. Monday-Thursday, 4 p.m.-midnight Friday, 9 a.m.-midnight Saturday, and 9 a.m.-10 p.m. Sunday. The restaurant’s official opening date is on Nov. 14. Adam Merkel Restaurants owns and operates Cello Italian Restaurant, The Silver Pig, and the original Diamond’s Steak and Seafood, all located in downtown Howell. Pinky’s Rooftop, another Adam Merkel Restaurant that will be located above Diamond’s in Royal Oak, is slated to open soon. In the interim, the upper level of Diamond’s will offer a pop-up version of Cello until the end of the year. Following that, the space will be renovated into Pinky’s Rooftop. Previous articleBlog: Check, Check, But Where Are the Balances?